Mark and Nicole welcome you to The Horns and Horseshoes Public House. The pub was built in the old parish of Harlow during the 1600's and began life as a shop, before opening as an Ale House in around 1745. Today ours is a family run, family friendly pub, still with the original beams covered in our unique collection of brass and large open fire creating a warm friendly atmosphere. We offer a variety of fresh home-made food prepared using local produce including our delivery of fresh fish on a Friday, and dont forget our famous Roast Dinners on a Sunday. 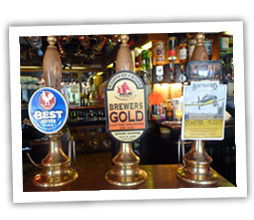 All of this is accompanied by a wide range of drinks that feature Real Ales from Breweries in the area. We have a good calander of events taking place throughout the year and regular evening entertainment in the bar. Check out above for all our upcoming events. With a front patio and large back garden with childrens area, there is somewhere for everyone to relax. If you have any occasion or event you would like us to help you organise please feel free to contact us on (01279) 422667.